at the end of the Indonesian Textile Heritage show. Being able to allow myself to be creative is the most challenging part. Overcoming fears, trying to find time to develop ideas while working full time, financial concerns… it is hard to start a career as an independent designer and along the way there's always a lot of excuses. But at the end of the day, I realize that I have to focus on my dream because whenever I finish a piece I can feel the joy and forget about all the struggles. I went to fashion school! I learnt my basic skills back in 2009 at LaSalle College in Jakarta, and followed that with an extra 2 year to earn a degree at Sugino Fashion College in Tokyo. It was definitely fun to be able to learn and met various teachers. I gained a lot by analyzing each and every teacher I met - their specialties, their style and how they did it. Most of the times, I found my inspiration through the fabric motifs. Following the motifs, I usually look through random pictures and gather up things that kinda catch my feel for that period of time: interiors, shapes of nature, and so on - endless inspiration! It is also important for me to balance the colour and the motifs in the fabric. I love playing around with that combo! 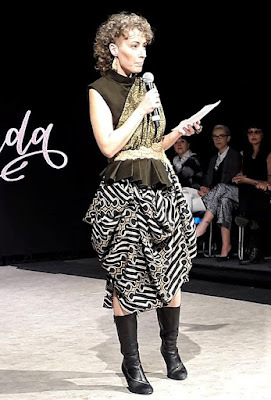 Indonesian Textile Heritage : A Contemporary Use of Noble Fabrics - Bernarda’s Collection revolves around Indonesian traditional textiles: songket and batik. Songket is traditionally considered as an exquisite, luxurious and prestigious fabric with a distinctive flower patterns while batik is a fabric full of symbolic patterns with designs that historically had been reserved for royalties. Sultry blue navy with gold, and ruby red represents the patterns’ rich culture, the grand of royal families. I love them all! But perhaps my favourite would be the jacket! You can contact me directly! Or you can find me on Instagram!! Developing more potential from my old designs. I definitely have to make them more comfortable and wearable. For example: I could try adding in pockets as well as making sure they’re durable!! Try to be involved in a lot of the fashion events, just any you can find! You can be dressers in a fashion show, you can attend workshops that talk around fashion, and also, I know I am also shy, but you it's really important that you network with people. Also, a lot of time needs to be dedicated to designing stuff. The more you make, the more you’ll realize all the small things that actually matter in the design process. All the best luck!